things to do at degmo! Hangingheld is a working farm so there are always jobs to be done. Visitors are invited to join us at work, whether it be feeding animals, shearing sheep, making hay, calving, weaning, or simply checking the livestock. 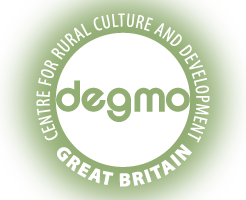 In addition, and according to the interests of individual groups, we offer a variety of demonstrations and workshops featuring aspects of rural life from both the Somali region and Britain. Somali nomads are accomplished herdsmen. Many of the older generation of Somalis now resident in the UK have spent their youth herding their family's livestock across the arid lands of the Somali region. It is a skill they never forget, and upon arrival at the farm are immediately at ease amongst our animals and keen to compare their knowledge of livestock with the methods we use to tend to our flocks and herds. Apart from the obvious difference between nomadic and sedentary lifestyles, it is reassuring to find that there are many similarities. The milk of the camel is a remarkable foodstuff and the mainstay of the traditional Somali diet. Somalis also use milk from their cows and goats, often for the churning of butter. Unfortunately we don't have camels on the farm (yet!) , so we have to make do with a visit to a neighbour's dairy farm where we see a modern milking parlour in action and learn how the milk sold in shops is produced. Using a genuine Haan brought from the Somali region and traditional dairy equipment from Britain we demonstrate the ancient art of churning butter as practiced in both countries, then compare results. Afterwards the Haan is cleaned using firebrands in a demonstration of culay, the highly sophisticated method of cleansing and sterilisation employed by Somali nomads. The making of cheese is not practiced by Somalis. We demonstrate how to milk a goat, use the produce to make a simple fresh cheese, and describe ways in which Somali nomads preserve their milk using souring and the creation of a type of yoghurt. Included in the daily menu is the preparation of popular Somali breads such as laxoor and kibis. Now is the time to examine the various cereals that are used for making bread in both the Somali region and Britain. We show how they are grown, the process by which grains can be milled into flour, and explain which types of flour provide the best taste and nutrition. Then comes the fun. Starting with raw ingredients, everyone will be encouraged to make and bake their own loaf of yeasted bread. Supermarket bread will never taste the same again! Somali society is based on an oral culture. All the news and information that we in Europe acquire from books and newspapers would, in the Somali region, traditionally have been gained from the recitation of poems, songs and stories. Even today, much of the history and traditions of the Somali people have yet to be written. It is therefore important that the young generation of Somalis growing up in the UK are encouraged to appreciate and value the oral culture of their people alongside that of the written word. Traditional life of Somali nomads. During visits to the farm, repeated references and comparisons are made to rural life in the Somali region. To illustrate some of the sophisticated methods used by Somali nomads to survive the harsh and unforgiving environment in which they live, we have available a comprehensive selection of genuine artefacts and an aqal soomaali nomads' tent, all collected over the past 25 years from the Somali region. During the evenings, these, together with numerous photographs, are used to illustrate talks and discussions that provide visitors with a unique insight into many aspects of traditional life in the Somali region. The Somali black headed sheep has no wool, so it a surprise for Somalis to discover that each year we must shear the wool from our sheep. After watching some sheep being shorn, we invite one of our neighbours, Sandy, to show how the fleece is spun and made into wool to be used for knitting clothes. Foraging for wild food and the use of plants as sources of natural remedies and medicines for the treatment of both humans and animals are highly developed skills amongst the nomads of the Somali region. Indeed, in many rural areas throughout Africa, Asia, the Middle East and South America similar practices survive. Although in industrialised Europe such knowledge has now all but vanished, the beneficial properties of plants and the uses to which they may be put were once widely understood by the inhabitants of the British countryside. On the farm we are able to illustrate some of the remarkable ways in which Somali nomads use their knowledge of plants and, by delving into the history books, contrast them with ways in which previous generations who farmed our land would once have used the herbs and trees with which we are surrounded. Another trait common to both Somali nomads and previous inhabitants of the farm is the supplement to their diets of wild fruits. Today, gathering wild food from the countryside is a pleasure, rather than a necessity, and when in season, visitors are able to enjoy picking and eating blackberries and wild raspberries, searching for mushrooms in the fields, gathering hazel nuts from the hedgerows, combing the moorland for winberries, making jelly from the fruit of the rowan tree and, in the autumn, harvesting sloes, damsons, crab apples, hips and haws. A walk around the farm is good for one's health and an education. Visitors are shown how, over generations, the landscape has been changed by human activity, the role of conservation in today's management of the land, and the use of a biomass boiler combined with a solar thermal system to provided heating and hot water for the farmhouse. There is also the opportunity to look for wildlife and appreciate the diversity of flowers and trees which grow on the farm. Tim is passionate about raptors and keeps an aviary of falcons, kestrels, hawks and owls. He is also friendly with ferrets. Of an evening he is often happy to bring a selection of his birds and ferrets for the visitors to meet. Ralph is another neighbour whom we like to visit. He produces apple juice using a variety of historic mills and presses that he has collected over his life time. The area around Herefordshire is well known for growing apples and pears to be used for both eating and the making of cider. Ralph also has a museum full of antique tractors and farm machinery which he takes pleasure in showing to visitors. In virtually every town that lies along the border between England and Wales are found livestock markets in which each week sheep and cattle are bought and sold. Similar scenes are common in the Somali region where there exists a long tradition of exporting surplus livestock to Arabia for meat. A visit to a market helps visitors understand the process by which the meat they eat in the cities is produced and makes for a memorable morning. At the end of each visit, and with the permission of our visitors, we like to invite farmers and friends and their families from the surrounding valley to join us for a Somali meal and an evening of socialising. If we are lucky, this may include performances by local musicians and singers. The cost of participating in all the above activities is included in the fee charged for visiting the farm. For those who are interested and willing to pay a little extra, we suggest the following.